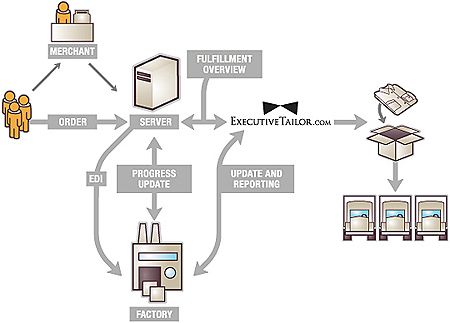 Executive Tailor, a maker of custom tailored men’s dress shirts, sought a fulfillment management system to help manage and automate their production processes. Having already created their e-commerce website, iNNOV was pleased to tackle this project as well. The customized system can track an order from production to shipment and finally, to delivery. The step-by-step fulfillment process is described below. We think you will agree that the Executive Tailor’s FMS truly does it all. iNNOV recently designed an exciting custom software system for use in Cifial’s Trade Shows and dealer showrooms across the country. The cutting-edge system consisted of a 32” LCD touch screen monitor integrated into a sleek, free-standing display unit. The interactive custom animations were also designed and implemented by the experienced design team at iNNOV. Once an order is placed, the customer service department at Executive Tailor is notified. A summary of all orders placed on a given day is generated by the FMS, and is placed in a queue. Once a specific target number of orders have accumulated within the queue, the order is sent to the factory for fulfillment. Every shirt within every order can be tracked individually via the FMS. Our system creates an unparalleled level of precision virtually eliminating inventory tracking and supply errors, allowing orders to be filled regardless of the sequence in which they arrived. Executive Tailor also uses proven Just in Time (JIT) methodology a proven approach that reduces costs and improves workflow by strategically scheduling material to arrive where needed at the proper time. This allows for smaller on-hand inventories and saves precious space. These asynchronous production and shipping systems deliver the flexibility and accountability that a competitive, growing company like Executive Tailor can depend on, every day. We were also able to create a custom bar coding structure for Executive Tailor. Once an individual order is received, the entire order is not shipped until all of the shirts in that specific order are received. This eliminates confusion and costly redundancies. Once all parts are received, labels are printed automatically, postage is applied, and a packing list is created. Finally, after a specified time period (two weeks), customer service processes an automated customer survey and generates auto-mailers that are sent to individual customers. Executive Tailor is quite pleased with their new level of efficiency, and the streamlined processes our custom designed FMS made possible.